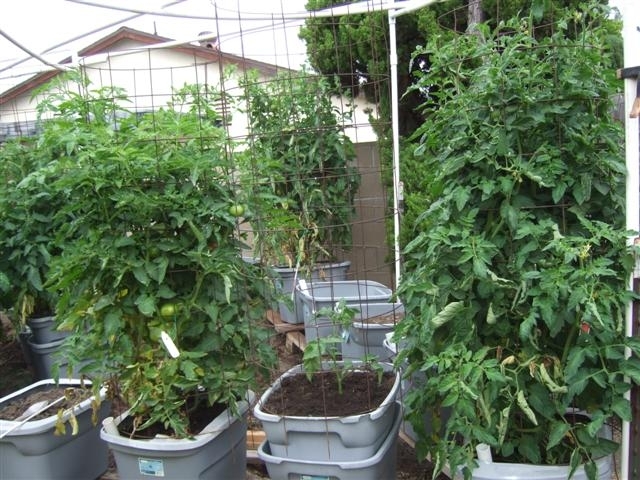 The tall tomatoes in the picture were planted end of April so they are now 2 months old. Very green, very healthy, some starting to ripen. It's a good year. When growing in containers, once this large, it's important to water every couple days. If you let your plant wilt due to lack of water, then water, then let it wilt again, then water there is a good chance you will have some "Blosson end rot" (dark spots on the bottoms of the tomatoes) Common in container tomatoes. Whether in the ground or in a container, I suggest you use a moisture meter to check when to water. The small tomato plant you see I just planted about a week ago and I have some empty containers ready for new plants. I like to stagger them so they just keep coming. The other picture is of a cucumber in a self watering container. Lots of little cucumbers setting on. The cucumber I plant is called "Sweet Success". 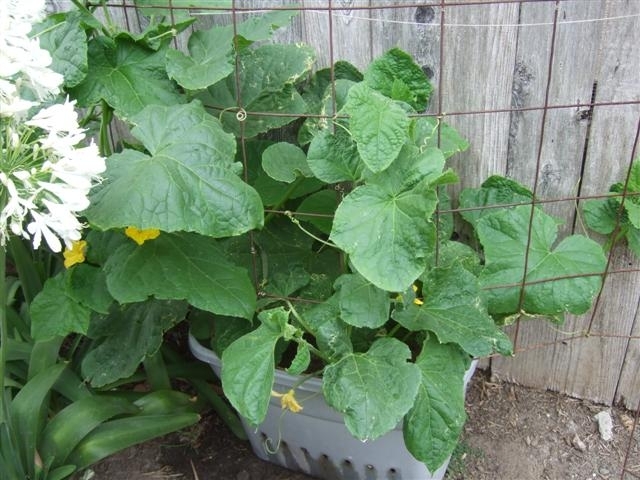 Google it....easy to grow, not many seeds, grows to a nice size and lots of cucumbers. Any difficulty finding "Sweet Success" seeds to plant, let me know. Discover activities for the whole family! 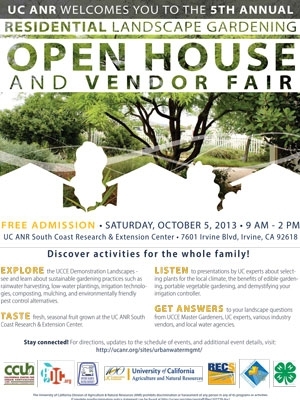 EXPLORE the UCCE Demonstration Landscapes - see and learn about sustainable gardening practices such as rainwater harvesting, low-water plantings, irrigation technologies, composting, mulching, and environmentally friendly pest control alternatives. Sponsor: UC ANR South Coast REC and UCCE – Orange Co.
Download flyer for more details and information. 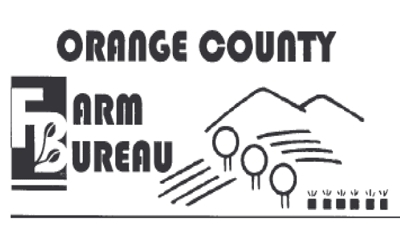 The UC Cooperative Extension Master Gardeners of Orange County, dedicated to providing residents with gardening guidance, reports that there are more than 20 community gardens in the greater OC area; yet there are no open Newport Beach community garden. Why not? Community gardens are not only beneficial to residents with plots, but to the community as a whole. Huntington Beach has a 2.5 acre community garden, and gardeners donate a portion of their crops to food banks and senior programs. A local Eagle Scout troop even built a rabbit-proof fence as a service project, making the garden a true community project. Costa Mesa has the Del Mar and Hamilton gardens, St. Paul’s Episcopal Church in Tustin hosts a garden for those without the space in their own homes, Santa Ana has Jerome CommUnity Learning Garden (where those utilizing it can give back by bringing their surplus to the facility for other community members) and UC Irvine has the Anthill Village Community Garden. Although they provide valuable services, the gardens are incredibly impacted; those hoping to plant at Del Mar and Hamilton gardens can expect to wait about two years. There is only one active community garden in Newport Beach: The Oasis Senior Center Community Gardens provide seniors with an outdoor activity as well as nutritious produce. Having a Newport Beach community garden open to all ages in Newport would encourage neighbors to interact and improve diets while providing an outlet for physical exercise. 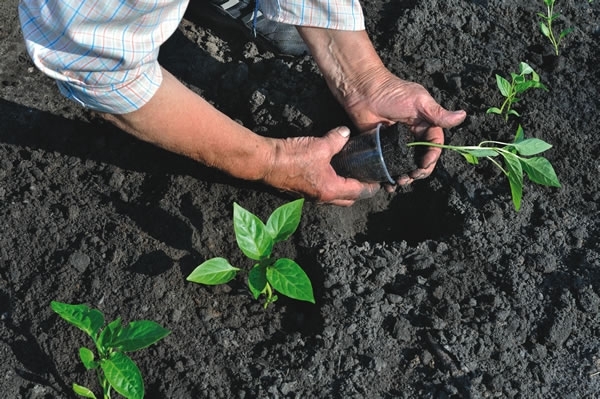 Growing a garden teaches about dependence on the land and can serve as an outdoor classroom. Gardens encourage environmentally conscious lifestyle changes and lead to a decreased carbon footprint. There’s also the added benefit of beautifying our communities. Read full community gardens article at Newport Beach Magazine. The 23rd Annual Charity Plant Auction & Chili Cookoff will be held at the Orange County Fair & Event Center beginning at 5PM. Download Event Flyer, Donation Form, & Chili Cookoff Entry Form. Also, the Fairy Garden Contest will be held the same day. Judging at the Plant Auction & Chili Cookoff. No entry fee, no limit on entries. Download Flyer. As the OC continues to become the urban center of California, agricultural education becomes more important. Therefore, we have come together to help expand the University of California Agriculture & Natural Resources’ South Coast Research and Extension Center (SCREC), so that one day it will be the premier ag-urban center of Southern California - The place where farmers can meet to learn ways to be good neighbors and preserve their livelihoods; a place where children can learn about their ag heritage; a place where everyone can learn about nutrition; a place where hands-on education is paramount; and a place where vital research can be done. September 21, 2013. 4P to 8P.